While technically the first company to use a continuously variable transmission in an automobile was the British Clyno Engineering in 1923, the concept only got popular in 1958, after DAF introduced the 600 with the wonderful Variomatic which made a small car act very funny. Most of us think trucks when it comes to DAF, but company founder Hub van Doorne turned to cars pretty quickly after he got successful by making trucks and buses that could satisfy the high demand of post-war Europe. He designed the Variomatic transmission which "consists of a "V" shaped drive belt and two pulleys, each of two cones, whose effective diameter can be changed so that the "V" belt runs nearer the spindle or nearer the rim, depending on the separation of the cones. These are synchronized so that the belt always remains at the same optimal tension", according to its Wikipedia article. Further reading also reveals that "because the system does not have separate gears, but one (continuously shifting) gear and a separate 'reverse mode' (as opposed to a reverse gear), the gear works in reverse as well, giving it the interesting side effect that the can drive backwards as fast as forwards. As a result, in the former Dutch annual backward driving world championship, the DAFs had to be put in a separate competition because no other car could keep up". There's a fun fact for you! 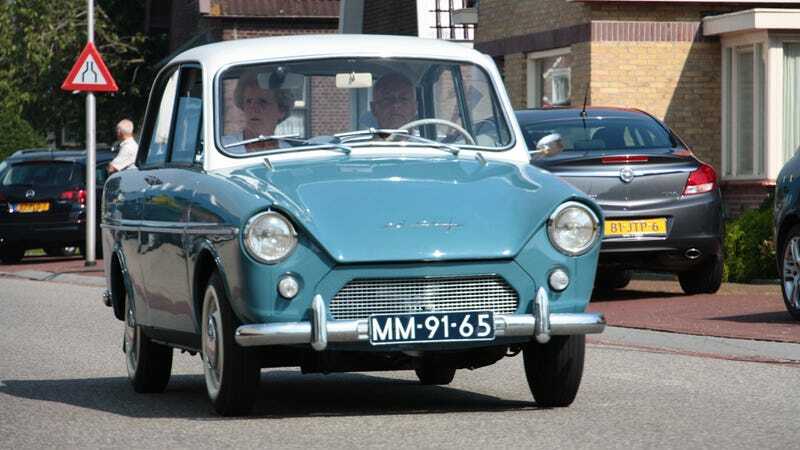 The Variometic-equipped DAF 600 that debuted at the 1958 Amsterdam Motor Show was not only the first car with a proper CVT, but also DAF's first production model and the first automatic from the Netherlands. Using a 590 cc flat twin engine and a light body designed by Johan van der Brugghen, it wasn't particularly fast, but remains the only car ever produced which went faster if the driver gently and gradually released the pedal once top speed had been reached. The reason is that the increased manifold vacuum helped the variable pulleys shift to an even higher ratio so even though the engine RPM stays the same, the transmission increases the car's speed, from 60 mph to almost a stagering 70! DAF put the technology into a series of its cars in the following decades. Eventually, Van Doorne's patents were transferred to a company called Van Doorne Transmissie, and when the passenger car division of DAF was sold to the Swedish in 1975, its CVT was used in the Volvo 340. Today, Robert Bosch GmbH has his drawings. Of the handful of DAF cars in the US, a 1960 600 was turned into an electric car after most of its mechanics went missing during the years of decay. It has Wisconsin plates, and sure looks more fun than a Prius!